This charming single-story home won’t last long! 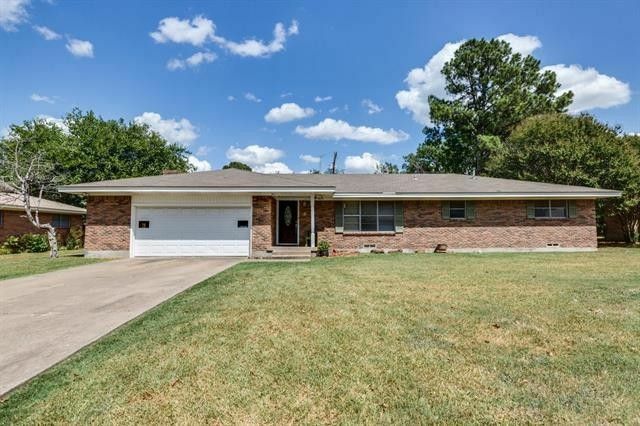 It sits on a third-acre lot conveniently located near I-30, shopping and dining and offers generously sized rooms, laminate hardwood flooring and tons of storage. The warm and inviting Family Room features a floor-to-ceiling brick fireplace, custom built-ins, crown molding, ceiling fan and sliding glass door to the huge backyard. The elegant Formal Dining has a brushed nickel chandelier, this room would also make a great Home Office. The spacious eat-in Kitchen includes original gingerbread cabinetry, laminate stone-look counters, stainless gas cooktop, oven and vent, mosaic back splash over the cooktop and breakfast bar seating. The Master Bedroom has His & Hers closets and an en-suite bath with a sit-down vanity, separate shower and built-in linen/hamper. The Secondary Bedrooms share a nice bath with dual sinks and built-in linen closet. The 2-car garage has an opener and 9 x 4 laundry niche. No HOA! Directions: I-30 to Greenville, exit 93 TX-34 (Wesley St), Turn North on TX-34 (Wesley St), Right on Terrell Rd, 2nd Left on Chapman, Home on Right.